Bridal hair & makeup. Manicure and pedicure. Born in Vinci on 7 June 1974. Pamela, since she was a child, has always shown her interest for fashion, hairstyle and every day changing of make up, trying it on herself. Once finished her compulsory education, Pamela had to start something that had to do with her passions, otherwise she wouldn’ t have concluded anything. Pamela attended an hairstylist course in Florence and meanwhile she worked in a shop followed by great artists. With time Pamela developed creativeness in haistyling, something that for a woman is very important. An hairstylist and a make-up artist are on the same wavelenght, and since Pamela didn’ t feel completely fulfilled she decided to attend the best course for bridal make-up and photography. Finally she felt that she had mastered the art, creating a complete harmony, managing to enhance the details of the face with the softness and brightness of the hair, bringing out the soul hidden in every woman. Art, elegance, charm and romanticism are the ingredients that represent Pamela with her touch and professionalism. When we think of a wedding, the first thought is for the bride and groom, the promises on their special day and sharing all this with relatives and friends. Italy, or better Tuscany, a little but big country, is very attractive for weddings; from the cities full of art, the villas and the farm holidays in the vegetation and plant life of the mediterranean. 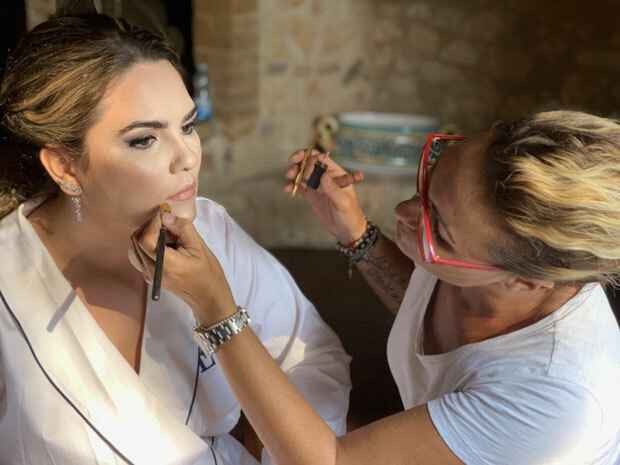 Pamela, for more than a decade, has been following the bride along her path: choosing little details for her, helping to match the hairstyle, make-up, manicure and pedicure according to the dress, to her build, to her face, to the bride’ s nature.